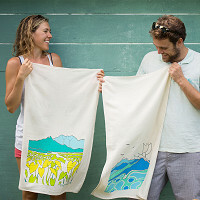 Katie and Merlin Edmonds channel their love for Hawaii into flour sack tea towels that celebrate the islands’ culture and scenery. Beyond sharing a family (the two are in-laws), Katie and Merlin share a passion for bright colors and bold designs. 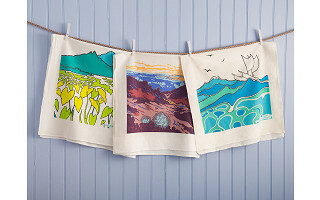 The vibrant prints come from Merlin’s artwork, which is inspired by his home state. The duo also shares a passion for being eco-conscious. So their towels are Made in the USA without bleach. This leaves the pure cotton fabric in its natural, creamy shade. The scenes are printed with water-based, BPA-free dyes using a unique printing process. Merlin’s scenes are dyed into the fabric so that, even after lots of use and many washes, the colors stay vibrant. What are Cultivate Hawaii tea towels made from? The tea towels are made from 100% floursack cotten with BPA-free dye. The fabric is lint-free and super absorbent. What are the dimensions of the tea towels? 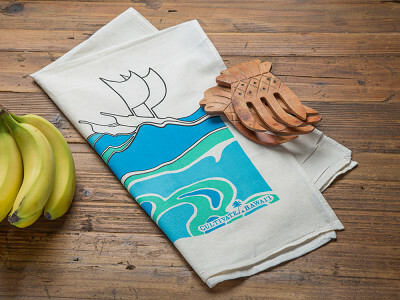 Cultivate Hawaii tea towels are 31” x 17"
How do I care for the tea towels? Machine wash and tumble dry low. Each is washed and preshrunk prior to shipping. 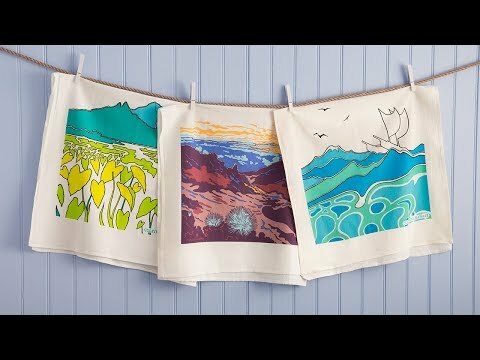 Katie and Merlin Edmonds channel their love for Hawaii into flour sack tea towels that celebrate the islands’ culture and scenery. Beyond sharing a family (the two are in-laws), Katie and Merlin share a passion for bright colors and bold designs. 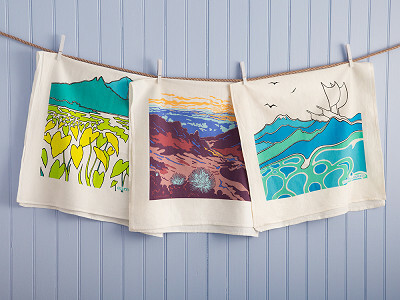 The vibrant prints come from Merlin’s artwork, which is inspired by his home state.